Turning from national and international leaders and celebrities (Michael R. Bloomberg, M.B.A. ’66, LL.D. ’14, Ellen Johnson Sirleaf, M.P.A. ’71, LL.D. ’11, Oprah Winfrey, LL.D. ’13), the University has gone local. Deval L. Patrick ’78, J.D. 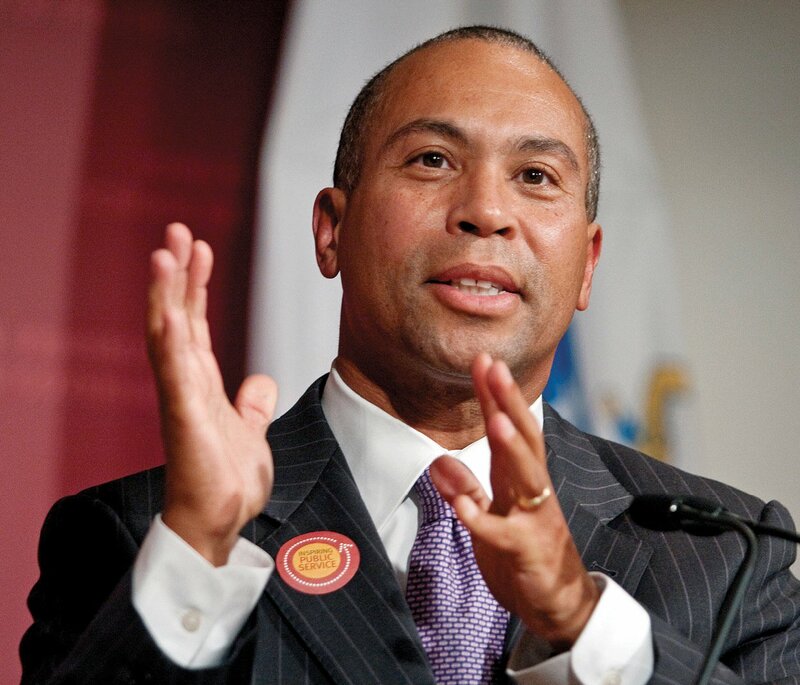 ’82, who completed his second term as Massachusetts governor in January, will be the guest speaker at the Afternoon Exercises of the 364th Commencement, on May 28. Since leaving office, Patrick has been a visiting fellow at MIT’s Innovation Initiative. For more details, see harvardmag.com/patrick-15. The College’s term bill—tuition, room, board, and student fees—will be $60,659 for 2015-2016, up 3.5 percent from $58,607 this year. The bill first exceeded $50,000 in 2010-2011; $40,000 in 2005-2006; and $30,000 in 1997-98. Princeton and Yale each imposed increases of approximately 4 percent, bringing their estimated costs of attendance, including books and personal expenses, to more than $60,000 per year, too.Separately, the College announced on March 31 that it had granted admission to 1,990 candidates from a record pool of 37,307 applicants seeking a place in the class of 2019: an admission rate of 5.3 percent. Stanford admitted 5 percent of 42,487 applicants and Yale 6.5 percent of 30,237 applicants. The two institutions said first-generation college students represented 16 and 16.8 percent of those admitted, respectively; Harvard’s figure was 14 to 15 percent. For further details, see harvardmag.com/costs-15. Paul Andrew has been appointed vice president for public affairs and communications, succeeding Christine Heenan, who has moved to the Bill & Melinda Gates Foundation (see Brevia, November-December 2014, page 33). Andrew, who came to Harvard in late 2012 as assistant vice president for communications—in time to work on the launch of The Harvard Campaign—was previously executive vice president at Weber Shandwick Worldwide, a public-relations firm. He recently served as acting vice president, and now has responsibility for communications, media relations, government affairs, and community relations. Professor of medicine Elizabeth Nabel, a cardiologist and president of the Harvard-affiliated Brigham and Women’s Hospital, will advise the National Football League on health and medical policies. The league’s players’ association earlier contracted with the Medical School to conduct health studies, in the wake of wide concern about concussions and other problems. Separately, the NFL retained Harvard Corporation member Theodore V. Wells Jr., a lead litigator at Paul, Weiss, Rifkind, Wharton & Garrison, to investigate “Deflategate”: the apparent under-inflation of footballs used during the New England Patriots-Indianapolis Colts conference championship game in January. Rather than building facilities abroad, the University of California, Berkeley, has announced plans for a nearby global education hub and approached schools from England to China, Japan, and Singapore. It aims to persuade foreign institutions to establish satellite locations on a 130-acre parcel just 10 miles away, where Berkeley and partner schools’ professors could create research and degree programs focusing on global governance, ethics, political economy, and cultural and international relations.…Yale plans to renovate its Hall of Graduate Studies, home to student residences and faculty offices, to build an interdepartmental humanities center (like Harvard’s Barker Center), while simultaneously constructing new graduate-student apartments nearby. Yale announced a $25-million gift for the work from Lisbet Rausing, Ph.D. ’93, a co-chair of The Harvard Campaign, and her husband, Peter Baldwin, a Yale alumnus.…Following a partially online doctoral nursing degree launched in 2011, Yale School of Medicine hasunveiled a “blended” master’s degree program for physician assistants, with online courses and in-person, clinical experiences at field sites around the country selected by Yale faculty members. The U.S. Department of Education’s (DOE) proposed ratings for university and college performance progressed in late December, with the unveiling of likely metrics. The aim is to help the public assess access, affordability, and student outcomes. Public institutions and community colleges have been more favorable toward the proposed ratings than have private institutions. Among the criteria the DOE outlined are the percentage of students enrolled at an institution who receive Pell Grants, their family income, and first-generation college status; a school’s average net price (after scholarships and grants); completion rates; and labor-market success (some measure of graduates’ incomes). In a December Washington Post interview, President Drew Faust said the ratings proposal “raises the issue of what do you rate them for? It goes back to what is college worth.…Is it all going to be about how much more money an individual makes with a college degree?” She continued, “I think these should be very complex portraits of institutions. And not reduce an institution to a simple metric.” The DOE intends to release the initial ratings this coming autumn. Rendering courtesy of Hopkins Architects Partnership LLP and Michael Van Valkenburgh Associates, Inc.
Harvard has released renderings of the pending conversion now that the former Holyoke Center has been renamed the Smith Campus Center. This illustration, presented to the Cambridge Historical Commission in March, depicts the remade Forbes Plaza and “welcome pavilion” facing Massachusetts Avenue. Overseers leaders. Karen Nelson Moore ’70, J.D. ’73, a judge on the U.S. Court of Appeals for the Sixth Circuit, will serve as president of the Board of Overseers for 2015-2016, succeeding intellectual-property lawyer Morgan Chu, J.D. ’76. Diana Nelson ’84 will be vice chair of the board’s executive committee, succeeding Walter Clair ’77, M.D. ’81, M.P.H. ’85, a cardiologist at Vanderbilt. Nelson, chair of Carlson, the travel and lodging company, and a longtime University fundraiser, serves on The Harvard Campaign’s executive committee. Toward teaching theater. The Faculty of Arts and Sciences (FAS) was expected to approve the new undergraduate concentration in theater, dance, and media as this issue went to press—an important step toward effecting the recommendations of President Drew Faust’s 2007-2008 arts task force, and increasing the role of performance and experiential learning within the curriculum. See http://harvardmagazine.com/2015/03/harvard-theater-major. Atop i tatti. Misheff professor of history of art and architecture Alina A. Payne, who trained as an architect and teaches about early modern and modern European architecture, has been appointed director of the Harvard University Center for Italian Renaissance Studies, at Villa I Tatti, near Florence. She assumes her new responsibilities this summer, succeeding Pescosolido professor of Romance languages and literatures Lino Pertile, director since 2010. Innovation overseer. Jodi Goldstein, M.B.A. ’96, director of the Harvard Innovation Lab since its inception in 2011, has been appointed managing director (the senior leadership role), effective in June. She succeeds Gordon Jones, who has accepted a decanal role at Boise State University (see Brevia, March-April, page 26). Computing at cornell. Cutting professor of computer science Greg Morrisett, a Harvard College Professor whose research focuses on computer security, is departing the School of Engineering and Applied Sciences to become dean of Cornell’s Faculty of Computing and Information Science, effective July 1. Bancroft honorand. Bell professor of history Sven Beckert has won a 2015 Bancroft Prize, the premiere recognition in historical scholarship, for Empire of Cotton: A Global History. He and the book were featured in “The New Histories” (November-December 2014, page 52). Read more at harvardmag.com/beckert-15. College chiefs. Clayton S. Rose, professor of management practice at Harvard Business School (HBS) and a former vice chairman in investment banking at J.P. Morgan, has been appointed president of Bowdoin College, effective in July. Clark G. Gilbert, president and CEO of Deseret News, has been named president of Brigham Young University-Idaho; he was previously a professor in HBS’s entrepreneurial-management unit. Gilbert succeeds Kim B. Clark, who was HBS dean before assuming his BYU responsibilities in 2005. Miscellany. David Brion Davis, Ph.D. ’56, Sterling professor of history emeritus at Yale, won the National Book Critics Circle award for nonfiction for The Problem of Slavery in the Age of Emancipation, the third volume in his trilogy on slavery around the world. A National Humanities Medalist in 2014, he received the Graduate School of Arts and Sciences’ Centennial Medal in 2009 (see harvardmag.com/medalists-15).…The Harvard Crimson reported in February that all the undergraduate Houses now offer mixed-gender suites; the FAS previously authorized allowing all upperclassmen to request such gender-neutral rooming options.…Zapol professor of anaesthesia Emery N. Brown has been elected a member of the National Academy of Engineering, the only Harvard faculty member so honored this year.